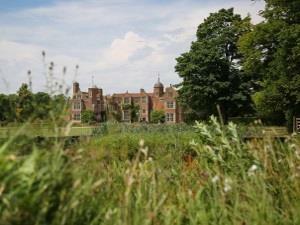 Built around 1500, Tymperleys was later a home to the Elizabethan scientist William Gilberd. Today it is a tearoom, with it's secret garden in the heart of the town centre but tucked away from the busy streets. Part of the Red Lion Hotel, one of Colchester Town Centre's oldest buildings, Red Lion Yard is today a shopping arcade - as it has been for centuries. Colchester's Dutch Quarter, named after the Flemish Weavers who settled there in the Tudor period, has many fine examples of Tudor architecture. National political and religious struggles were reflected in dramatic local events in the 16th Century. St Botolph's Priory & St John's Abbey were both closed down in King Henry VIII's dissolution of the monasteries in the 1530's. In the reign of his zealous Catholic daughter Queen Mary, forty Protestants from Colchester and the surrounding district were burnt alive at the stake as heretics; a larger proportion, relative to population, than in any other town in England. When Mary was succeeded as Queen by her sister Elizabeth I, Colchester became a haven for Protestants fleeing from Flanders, where they had been defeated in a rebellion against Catholic Spain. Many of them were skilled weavers, and it was through this Dutch community that Colchester became famous for high-quality cloths. The district where most of the Flemish weavers lived and worked is known to this day as the Dutch Quarter, and many of their timber framed house still stand in this historical part of town. 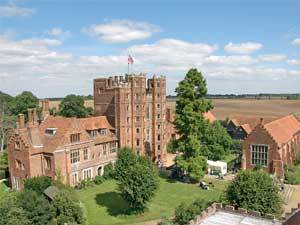 Layer Marney Tower is a fine Tudor building, built from warm red brick in the first half of the reign of Henry VIII. It was intended to be the entrance to a stately Tudor home, but only the Gatehouse was completed. In the heart of Colchester is Tymperleys tea room, first constructed in 1490, when it was the home of John Tymperley, the representative of the Duke of Norfolk in Colchester. Its most famous resident was William Gilberd. He was a physician at the court of Elizabeth 1st, and as a scientist he coined the term “electricity”.